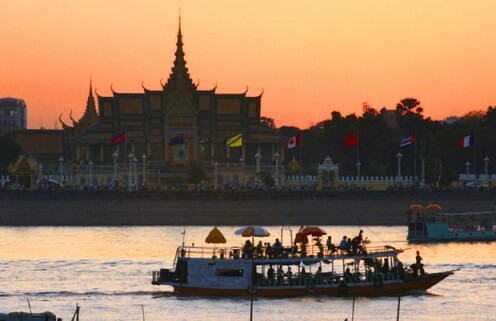 Here are the top attractions and activities to enjoy your vacation in Phnom Penh. Tuol Sleng Genocide Museum (S-21) and Choeung Ek Killing Fields Memorial are the most popular tourist attractions in Phnom Penh. 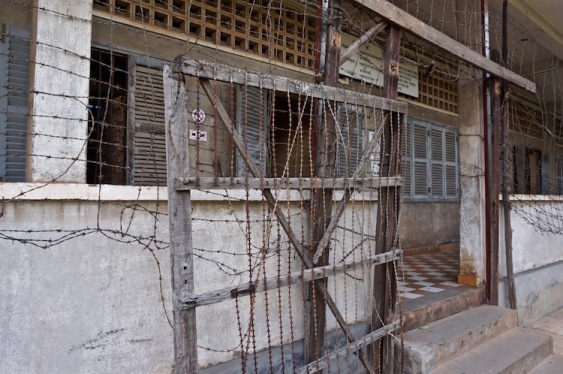 You may find it emotional or even shocked while visiting these sites but it is essential stops to understand the recent tragic Cambodian history..
Tuol Sleng, also known as S-21prison, was a high school that the Khmer Rouge regime used as an interrogation and torture centre. Most rooms have been left in the state they were found in January 1979, including classrooms divided into tiny cells. The haunting identity photos of the prisoners who suffered here are exhibited throughout the museum. Choeung Ek Memorial (best known as the Killing Fields),17km south of Phnom Penh, is one of the many killing fields or execution and burial grounds used by the Khmer Rouge throughout Cambodia. Mass graves were discovered there after the Khmer Rouge fled the city, and estimates say up to 15,000 people were executed there. The visit, with informative audio guides in many languages, is very detailed and includes testimony from both survivors and guards of the regime. Covering an area of 174,870 square metres, the Royal Palace is open to visitors, even though the king of Cambodia still lives there occasionally (if the blue royal flag is flying, the king is in residence). Different buildings have been added and restored over time, even up until the mid-1960s, but some date back to the 19th century. You can visit the Throne Hall with ceiling murals depicting the story of the Ramayana, the Moonlight Pavilion where classical Khmer dances have been performed for decades, and the Silver Pagoda, named after the five tones of tiles covering its floor. The Silver Pagoda also houses the famous Emerald Buddha. With more than 1,800 works on display, the National Museum of Cambodia has one of the largest collections of Khmer art. 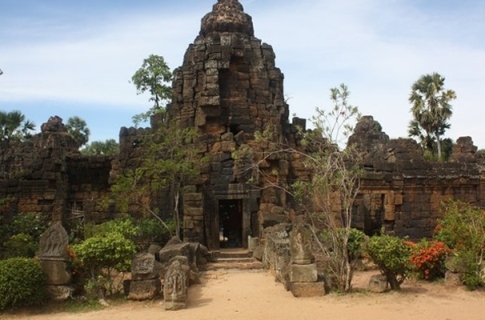 There are numerous sculptures, ceramics, and ethnographic objects such as theatrical costumes or marriage boxes, dating from the prehistoric to post-Angkorian periods. The building dates from the early 20th century but reflects “traditional Khmer” architecture. The garden and ponds feature statues of different types and divinities. Note that taking photos inside the museum is not allowed. 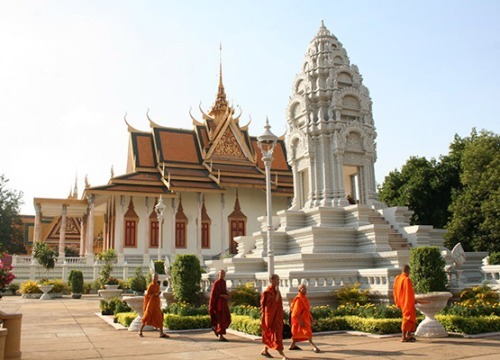 This is a must-see visit while in Phnom Penh. River cruises start at Sisowath Quay, Riverside, between Street 178 and Street 130. Expect to be asked many times to choose a boat and cruise company as you walk past. There are daytime and evening sunset cruises, which are the most popular. This is a great way to see the city from a different perspective and enjoy beautiful views of the Royal Palace and Riverside. The usual route goes down the Tonle Sap, onto the Mekong and up the shore of Kandal Province on the other side, to view floating fishing villages before returning, or ask for other options. You can find Angkor Wat alike temples in Phnom Penh. Just one hour driving to the south of Phnom Penh, there is a beautifully preserved laterite temple, Ta Prohm. Like the temple of the same name near Siem Reap, this temple dates back to the late 12th century. The carvings on the outside of the structure are in very good condition and bas-reliefs illustrating Hindu mythology are all around. The smaller Yey Peo temple is 200 metres to the north, and the small lake Tonle Bati is a popular picnic spot with locals. Huts and hammocks are available to rent at the lake. Families and animal lovers will enjoy the Phnom Tamao Wildlife Rescue Centre, a sanctuary for rescued animals. Established in 1995, it is the largest zoo in Cambodia. They also run breeding programs for threatened species, and animals are released back into the wild whenever possible. For a really unique experience, the pricier Wildlife Tour lets you spend the day with the animals: learn how to care for elephants, tigers, gibbons and other endangered species, as well as the rescued baby animals in the nursery. Another option is Bear Keeper for a Day, with a behind-the-scenes experience looking after rescued endangered bears and working with their keepers for the day. It is a must to watch an Apsara dance performance. 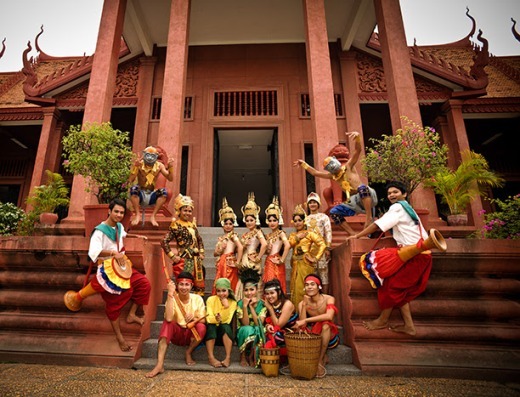 Apsara is a traditional Khmer dance dated back to the 18th century, but was almost lost under the Khmer Rouge regime. Cambodian Living Arts revived the art by gathering surviving master artists to train and pass on their knowledge to younger generations. They also organize tours to watch classes and ask questions to both students and master artists for a more in-depth experience. The Cambodian Living Arts Plae Pakaa performances take place outdoor every day in the National Museum gardens from October through to March. Apsara dance performance is truly a beautiful and unique experience that shouldn’t be missed. Silk Island is just a short boat ride up the Mekong from Phnom Penh. So named for the numerous silk producers on the island, this gives a fascinating look into an ancient local industry. The best way to visit this island is hopping on a bike and cycling around to see people weaving silk in their home-based businesses. You can buy silk garments or material direct for sourvenirs. If there’s one thing Phnom Penh has plenty of, it is markets (phsars in Khmer). Large, small and everything in-between, you’ll find clusters of stalls in main streets and sides around the city, selling lots of everything. If you’re pressed for time, you can get the full experience at the must-see Central Market and the slightly further-afield Russian Market. Both will excite all your senses, but have different atmospheres and are known for their own specialties and bargains are assured. You may have heard that Cambodian food is like Thai food, but not as spicy. While there are similarities with many of the other regional cuisines, Khmer cooking has a style and flavour of its own that’s best discovered by getting hands-on in the kitchen. 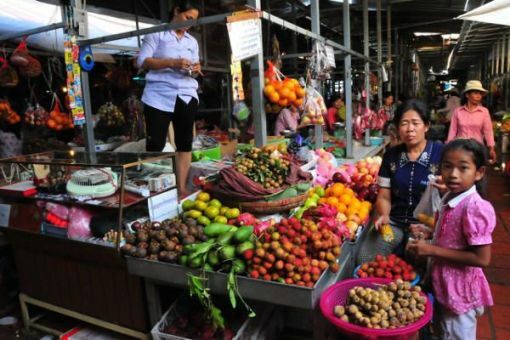 There are several really good cooking classes that will take you shopping through the local market to buy the fresh ingredients, and then back to the professional kitchens to prepare freshly cooked Khmer dishes like fish amok, pomelo and shrimp salad, beef lok lak, and super-sweet desserts. Some of the best on offer are from La Table Khmere in BKK1, Feel Good Café in Street 136 near Riverside, or Cambodia Cooking Class in Street 240 behind the Royal Palace.